Sodium is one of the most abundant elements, widely distributed on the Earth and in the ocean. Thus, sodium-ion batteries attract much attention for application in large-scale energy storage. The most popular cathodes for SIBs, i.e., the layered sodium-containing oxides, usually exhibit reversible host rearrangement between P-type and O-type stacking upon charge/discharge. Such a host rearrangement is unfavorable due to several factors: (1) The O-type phase is undesirable relative to the P-type, as the latter possesses a more open framework for Na-ion transport; (2) The rearrangements of host structure indicate sluggish reaction dynamics, which contributes to the voltage hysteresis and poor rate capability of the electrode; (3) The large variation in lattice parameters between P-type and O-type leads to elastic strain, causing the loss of active material and the resulting capacity fade. On the basis of the above reasons, Haoshen Zhou and Shaohua Guo's Group from Nanjing University synthesized the O3-type Na0.8Ni0.3Co0.1Ti0.6O2 (NNCT), and found that the NNCT electrode exhibited the cation-mixing characteristic by introducing transition-metal ions into Na layers during initial charge, thus suppressing host rearrangement upon charge/discharge by the induced "pinning effect." Moreover, the O-type phase is undesirable relative to the P-type, as the latter possesses a more open framework for Na-ion transport. 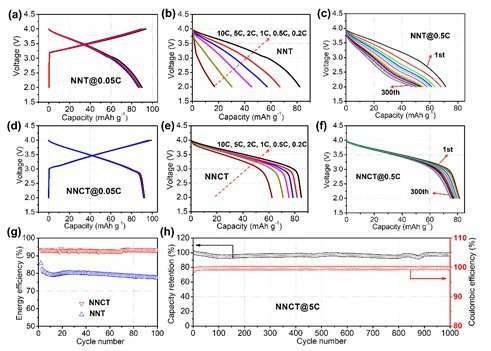 Consequently, the NNCT with stable P3-stacking after initial charge process exhibits superior rate capability, high energy efficiency and excellent cycling performance. This group characterized the structural evolution during electrochemical sodium insertion/extraction by in-situ XRD and ex-situ STEM experiments. Fig. 1 shows the structural evolution of the NNCT electrode during the first cycle. NNCT transforms to P3-type in the initial charge process as do most others, but unexpectedly maintains the P3-stacking in the subsequent cycles. STEM results indicate the presence of transition-metal ions in sodium layers at the charged NNCT electrode, exhibiting the cation-mixing phenomenon. The electrochemical performances of NNT and NNCT cathodes were comparatively studied in Fig. 2. The almost overlap curves suggest the high reversibility of NNCT with a reversible capacity of 92 mAh* g-1 at 0.05C rate. The discharge curves show a high capacity retention (92 percent) and negligible voltage degradation (0.03V) over 300 cycles are observed. The round-trip energy efficiency is stabilized at 93 percent for the NNCT electrode, and the Coulombic efficiency of NNCT cathode is around 99.7 percent. More importantly, NNCT cathode performs excellent long-term cycling performance, i.e., 98 percent capacity retention after 1000 cycles. 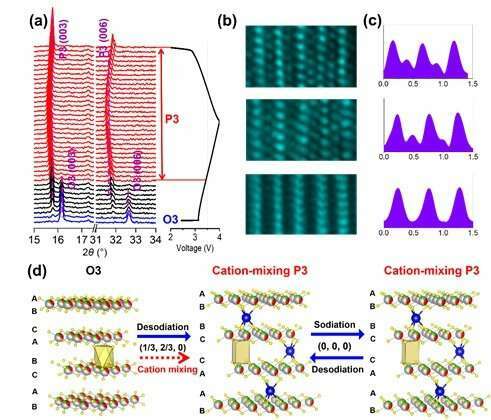 This work proposes that the "pinning effect" induced by introducing cation-mixing could effectively suppress the phase transition and relative host arrangement, thus greatly enhancing the structural stability. The findings underline the critical role of stable sodium storage framework, and also open a new path for design of high-efficiency energy storage materials.